Now that Bernie Ecclestone is bringing back street races, it suddenly seems that opinion has shifted against them. It was not that long ago that the possibility of street races returning looked very unlikely and many were the nostalgic glances back at great races remembered in the streets of those few cities prepared to close for a weekend. 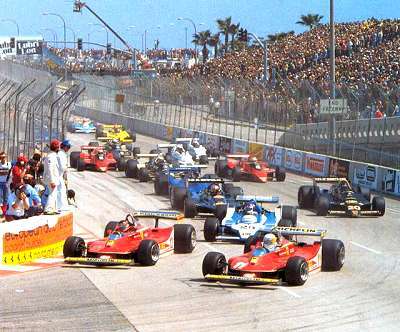 The sight of the cars streaming down to the hairpin at Long Beach, in particular, is unforgettable. So why are there so many doubting voices raised, now that two street races have been added to the calendar for future years? I can only presume that the fashion for criticizing the Monaco GP has led to an assumption that all street races are the same, tight circuits with nowhere to pass, leading to processional races decided at the first corner. Yet it does not have to be so. The Detroit Grand Prix of the early eighties was always accused of being a silly place to go F1 racing and the same was said of it as is now said of Monaco - nowhere to overtake. Has everyone forgotten the great races it produced? John Watson proved everyone wrong about overtaking by winning from 17th on the grid in 1982. That is the strange thing about street races - they seem too tight and narrow for modern F1 cars and yet, so often, they produce races every bit as exciting as circuit races. All it takes is for one or two drivers to have the same overtaking ability as Watson had and you have a race in which the unpredictable can happen. When it comes to spectacle, there is nothing that can beat a street race. The sound of the cars echoes off the surrounding buildings, familiar landmarks shoot past the speeding cars and the crowd can get closer to the action than anywhere else. The Singapore street circuit looks fairly open and the proximity to water always provides extra atmosphere. I think we should give it a chance, at least. So I have to be for the introduction of a few more street races. Anything has to be better than the bland offerings of the last decade; featureless circuits placed in empty landscapes with only the fanciful hospitality suites to provide any relief for the eye.